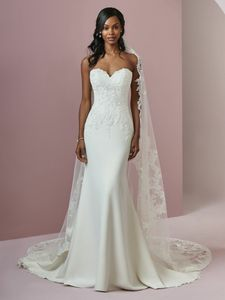 Description: This Aldora Crepe fit-and-flare wedding gown features embroidered lace motifs along the bodice, strapless sweetheart neckline, and back hemline. Subtle illusion accented in lace motifs completes the scoop back. Finished with crystal buttons and zipper closure. Detachable tulle accessory accented in lace motifs can be worn as a train or veil; sold separately.